﻿ River Kwai Hotel, Kanchanaburi | FROM $21 - SAVE ON AGODA! "Simple rooms, clean, nice facilities." 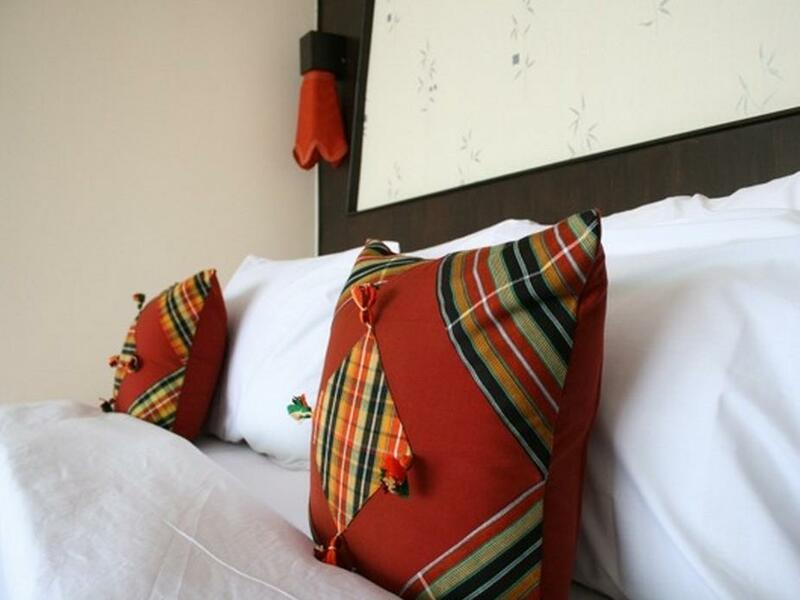 Have a question for River Kwai Hotel? "Good hotel for this price!Very good swimming pool!" "I really love this hotel and will stay at this hotel again next time!" "Clean and with big pillows." 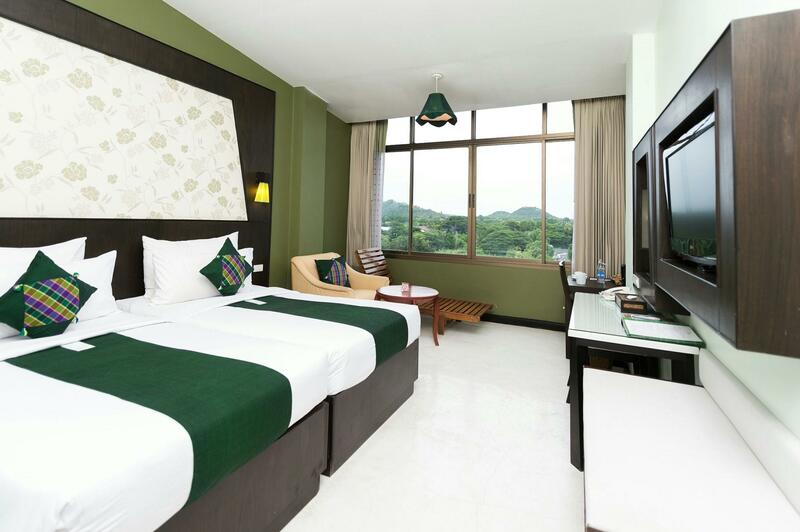 This city center hotel offers a comfortable and convenient base for exploring Kanchanaburi’s main attractions. The 3-star River Kwai Hotel is located in the heart of the city with easy access to taxis, buses, and trains, and the train station is only one kilometer away from the hotel. Taxi or tuk-tuk rides from the River Kwai Hotel to the Bridge, the War Cemetary, and the Tiger Temple will take minutes and set you back between 40 to 100 baht, depending on your bargaining skills! The rooms at the River Kwai Hotel are basic, but equipped with all modern amenities and, most importantly, are clean and spacious. The Cowboy bar and disco in front of the hotel provides a great hangout place after a day of sightseeing. 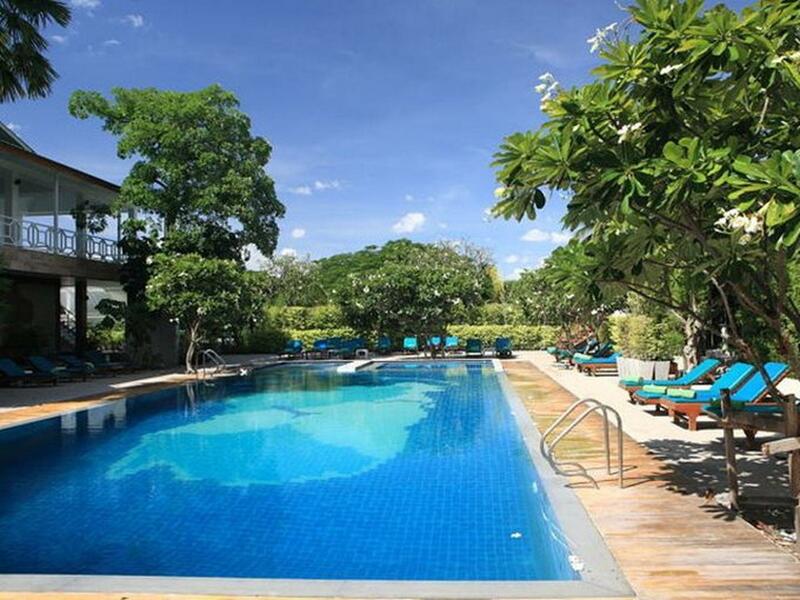 Close to attractions, River Kwai Hotel makes for an excellent base when in Kanchanaburi. "The room was nice and clean as well as the swimming pool." Great location, within walking distance of the railway and bus station, with very friendly and helpful staff. The room I had was clean, but I would advise against using the swimming pool as pigeons would flock there every morning and leave their waste behind. Nonetheless a fantastic stay! Location is about 1/2 way between train and bus terminal. Good facilities at the hotel, but not much other nearby. The entrance to the hotel is not what you see in the pictures. Stayed for one night which was ample. Large rooms and nice bed but very dated. Needs upgrading but great location and the restaurant outside the hotel was amazing! The hotel is old, but it is properly maintained. It look like it was a nice hotel before. The room is big, there is bathtub and the water heating and pressure is good. AC works well and bed, room is big. Breakfast buffet is respectable. I would actually stay here again. Good for couple and family. The hotel was in a pretty easy location, close to the railway station and not too far from the bus station. The room was nice and clean as well as the swimming pool. I enjoyed having the Glitzy Chill just outside for food and drink and live music. Gave the place a nice atmosphere! Overall i was happy with this hotel. First impressions were good,when i arrived. Professional staff,good reception and sevice. The room was fine with a very comfortable bed. I just felt the room was a bit dated and needed a bit of modernising. The bathroom let it down.Very poor shower. The shower was just an old limescale encrusted mixer shower and no hot water half the time. Desperately needs an uprade. I liked the pool.It was a good sixe with plenty of spave around it. The restauant was also very good with an unusually varied selection of German beers! I liked it overall but the bathroom puts me off.I like a good shower,but this was aweful...and cold. The location is very convenient as it's close to the bus terminal (But a bit far from the Bridge). The staff is very nice and the hotel offers a very rich breakfast, my boyfriend and I were super satisfied with it. The bed is comfy but the room might need some renovation. All in all, I really liked this hotel. If I would visit Kanchanaburi again, I'd choose this hotel for sure. Stayed here many times. Still needs updating. On the fourth floor there appears to be holes in certain doors and marks on carpets which appear to be made by RATS. Very concerning. Quite a nice swimming pool area. REALLY NEEDS UPDATING!!!!!!! I was allocated at a 2nd floor room, but the room is too old and there is water leaking issue, they change it to room at 5th floor. The room is good just there is some water stability issue. The tap water is a kind so hard water so there is some white powder appears when u boiling it but it is consumable. I have tried it :). The breakfast is good. I like the fried rice a lot. Stayed for 4 nights with 8-9-14 children. Everything was safe. Kids love the pool and the breakfast selection was great. I would recommend this hotel to any one with the children. Only problem was the internet system. We each had to get a new code every 8 hrs which was pointless and hard to use at times. Friendly staff, comfortable room and good quality breakfast. We enjoyed staying here and will stay here again if in the area. The room was comfortable but not very large. The staff was very friendly checking in and out. The breakfast was very good with a nice layout and good egg preparation. I especially liked the wood-carved furniture in the lobby and on the wall by the elevator. The hotel has obviously been a very impressive one in the past. It is now a little dated but still has impressive ornate furnishings in the lobby area. Bedrooms although a little dated are large with comfortable bedding and furnishings. A bedside clock would be a welcome addition. Staff are friendly and helpful - they were very obliging in organising cars for a trip to Hellfire Pass and the trip back t Bangkok. The doorman was extremely helpful during heavy rain. Over the past few weeks, with a couple of friends, we drove around parts of the southern and central Thailand. Working to a budget and primarily looking for short term accommodation the River Kwai Hotel Kanchanaburi was more than adequate for the needs of a sight seeing in transit tourist. What I like about this hotel is that it is situated on the main road from BKK, has a nice bar, and a hair dresser just a few steps from the hotel. The reception service is very good. The rooms have been renovated which are quite nice for the price. However, the hall needs some renovation and recarpetted. Laundry service is quick with low cost.